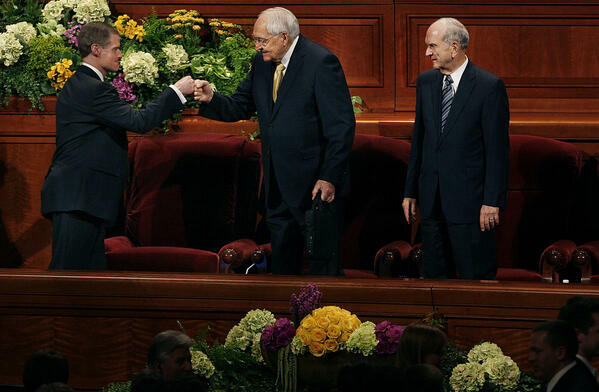 Yesterday saw the passing of a great man, Elder L. Tom Perry. Known for his infectious smile and enthusiasm Elder Perry will be missed my many both inside and out of the LDS church. 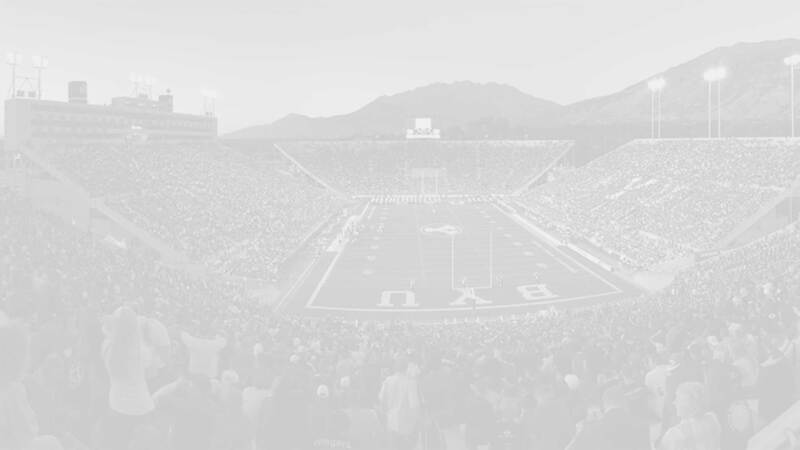 Those close to BYU athletics recognize Elder Perry as one of the most prominent and notable fans that would regularly attend football and basketball games. But Elder Perry isn’t a BYU alum, which begs the question: Why was Elder Perry such a big BYU fan? Elder Perry has always been a big sports fan, dating back to his childhood days as a volleyball (vanball) player. His team won the all-church tournament in 1940 after having finished second the two years previous. As an LDS missionary in Iowa he received special permission to leave mission boundaries with his companion to participate in the Midwest region YMCA volleyball tournament. His team finished second and he was named tournament MVP. His playing days ended in his youth but he remained a sports enthusiast throughout his life. When he lived in Boston he became a Red Sox, Bruins, and Celtics fan. He remained a Red Sox fan and had the privilege of throwing out a first pitch at a Sox game a few years ago. His NBA loyalty has shifted with age and Perry sightings were not altogether infrequent at Utah Jazz games over the last two decades. When it came to college hoops and the gridiron he cheered for both the USU Aggies (his alma mater) as well as BYU. Elder Perry was no stranger to the BYU campus. 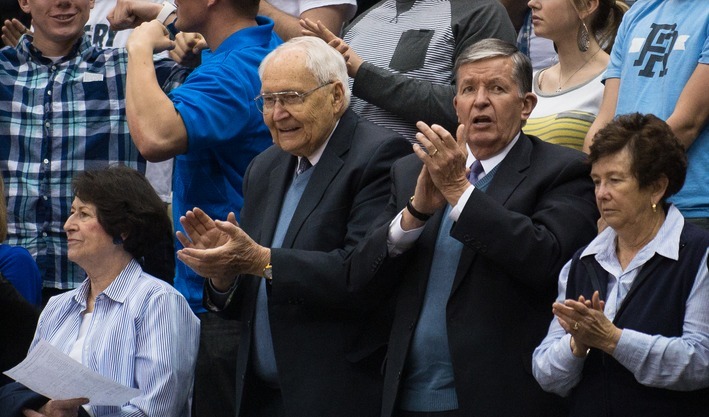 He gave 23 Tuesday devotional addresses in the Marriott Center as well as the commencement speech in 2013. He was also involved in a number of education week, youth conferences, and other events held on BYU campus. The special collections portion of BYU’s Harold B. Lee library was named in Elder Perry’s honor by Aline and L. Sam Skaggs, following a $3 million dollar donation to the new library in 1999. At the re-dedication President Bateman noted that the new 50,000 square foot Special Collections library was a fitting tribute to a man known for his integrity, compassion, and love of learning. A thank you letter that Elder Perry wrote to the Skaggs is permanently displayed in the library. Finally, Elder Perry was tied to BYU through a number of connections and relationships. His son Lee is currently serving as the Dean of the Marriott School of Business. Several grandchildren have also attended BYU. And you can’t overstate the relationship between the LDS church and its flagship institution. As a prominent leader in the church Elder Perry embraced that relationship and supported not just the school but its athletic programs as well. 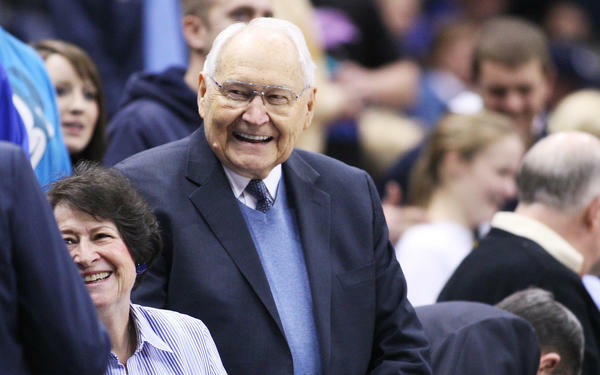 Whatever the reason for his fandom Elder Perry has always been beloved by Cougar faithful. His big heart, smile, and booming voice singing the Cougar fight song will certainly be missed.